Jolene has presented shows annually in Winnipeg since 2000 and toured her work to national and international critical acclaim. Select credits include: Today Art Museum (Beijing), Xi’an Art Museum (Xi’an), The Joyce SoHo’s Inbound Festival (New York City), The National Gallery of Canada, The National Arts Centre’s Prairie Scene, International Solo Dance-Theatre Festival (Stuttgart), in/future (Toronto), The Winnipeg Symphony Orchestra’s New Music Festival, New Dance Alliance (New York City), The Winnipeg Art Gallery, The Canadian Museum for Human Rights, collaborative projects with Visual Artist, Wanda Koop, dance: made in canada, Dancing on the Edge, numerous Canadian tours, Femfest, Studio 303, 208 fringe festival performances, 18 years of touring, and more. 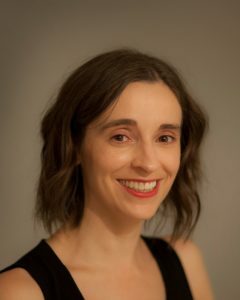 Jolene holds a Masters of Fine Art in Dance through The American Dance Festival/Hollins University, where she received Fellowships for three years of choreographic research. Her thesis work was presented at The American Dance Festival in 2012. Jolene has trained at institutions, intensives, schools, and with Master Teachers all over North America. She is a graduate of The School of Contemporary Dancers, holds BA honors degree in dance, and a Teacher’s Certificate with Distinction. Jolene is the Founding Artistic Director of Gearshifting Performance Works, for which she created 39 original works, including ten full length works. Jolene managed her self-initiated work for 19 years, programming a full season of activity for 17 years, including hiring an ensemble of dancers, managing large scale projects and tours, producing the work of Guest Artists, and managing the day to day activities of a contemporary dance company.